The wrist is the most commonly injured site in the skeleton, accounting for between 3% and 9% of athletic injuries. A fall onto an outstretched hand (FOOSH) is the typical mechanism. Of potential bone fractures, those affecting the distal radius and ulna are the most prevalent. When carpal bones are affected, the scaphoid comprises 60% to 70% of fractures. Scapholunate dissociation – scapholunate and radiolunate ligaments. Given the complexity of the wrist, a combination of imaging modalities is typically necessary to compliment patient history and clinical examination of FOOSH injuries. X-ray is valuable for initial investigation of any fractures/dislocations and 5-10 day follow-up imaging, particularly if occult scaphoid fracture is suspected. CT and/or tomosynthesis, a new type of X-Ray/CT hybrid imaging modality, may be required to better appreciate complex or occult fractures. MRI plays an important role in the assessment of ligament integrity and other soft tissue involvement. Mr M, a 41 year old office worker was referred by his health care practitioner for a right wrist MRI study due to persisting pain following a motorbike accident. Initial x-rays demonstrated a widened scapholunate articulation. Symptoms were intermittent and particularly aggravated by hand shaking when greeting people. Tenderness was elicited over the proximal row of carpal bones towards the thumb. Complete scapholunate ligament tear with mild scapholunate dissociation. Small, most likely degenerative, cysts located in the capitate and trapezoid, but no visible fracture. If we can be of assistance with wrist imaging, contact us on 03 9592 3319. Hayter C, et al. 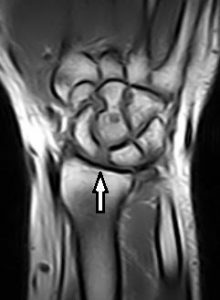 Magnetic resonance imaging of the wrist: Bone and cartilage injury. JMRI 2013;37:1005-1019. 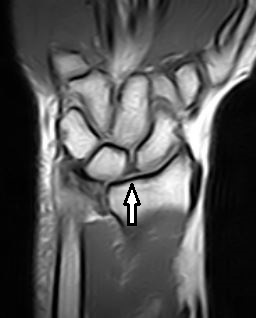 Ringler M. MRI of Wrist Ligaments. J Hand Surg 2013;38A:2034–2046.